Everyone likes to save a bit of money, but for students especially, any cash saved can make a big difference. Luckily for Aussie students, there are plenty of cheap phone plans around, not to mention specific student discounts and bonuses on offer from some of the bigger telcos. Before you begin your comparison, you’ll need to consider what is important for you when it comes to a phone plan. Whether you’re looking to save money on a prepaid or postpaid plan, you want lots of data or you’d like a plan with some entertainment extras to enjoy during study breaks, it’s important to have an idea of what you want from a phone plan. Once you know what you need from a phone plan, and how much you have to spend in your budget, you can delve into what student-friendly phone plans are available from the telcos. Vodafone is the teco that possibly has the widest range of phone plan deals for students. Often, these student deals come in the form of discounts on both existing plans and plans in conjunction with phones. It’s worth keeping a look out on the Vodafone website to see what the current offers are. In addition to the discounts offered directly, Vodafone has also teamed up with ‘UNiDAYS’ to deliver other discounts to students — so it pays to check back in regularly. Vodafone offers both prepaid and postpaid phone plans, along with plans bundled with a new device. The following table includes sponsored links to Vodafone’s range of postpaid SIM-only plans. Telstra offers a range of reasonably priced postpaid and prepaid plans for its customers. The Telstra Student Hub has a selection of deals that are most useful to students, whether it’s a SIM-only plan or a cheap prepaid phone. While Telstra might not have the cheapest plans around, you’re at least getting a significant chunk of data and other perks to make it worth your while to consider making the switch. Currently students can access the Student BYO Mobile Plan, where for $49, you’ll get 30GB (15GB + 15GB bonus data) of data and access to ‘peace of mind’ data at no extra cost, which means that once you’ve used your data allowance, you can keep using your data but at a capped speed of 1.5Mbps. Students may find benefit in the extra perks that Telstra can provide, such as access to the Telstra Air network with over one million hotspots across Australia. Another great perk is access to data-free music streaming with Apple Music, and data-free streaming of live sports, including the NRL, AFL, ALFW, Netball and A League. For students who are more inclined to stay up-to-date with the latest smartphones, Telstra also offers a wide range of phone plans. Prices vary depending on the device, but at about $100 a month you can grab the latest iPhone with generous data inclusions. While not the cheapest provider, Telstra’s list of extra perks could be useful for students. Optus is arguably a bit more student-friendly, offering a few deals in its own Student Hub. You’ll need to be able to verify your student status with Optus in order to be eligible for any discounts or bonuses that are currently running. Once you’re in the Student Hub, you’ll be able to view the discounts available at the time on both SIM-only and phone-on-a-plan deals. These discounts may only be applicable to certain plans at certain times, so it’s worth checking out the website to see what is currently on offer. Optus shines brightest with data-free streaming entertainment extras. Some plans require you to pay extra to access these perks, while the pricier plans will generally include these bonuses as part of your monthly charge. You’ll get access to Optus Sport and Nat Geo, along with data-free music streaming on Spotify, Google Play, iHeart Radio. Depending on your plan, you might also have access to data-free mobile TV streaming, which includes Netflix, Stan and the various ABC streaming platforms; otherwise, it’s available for $5 per month. The best student deals with Optus tend to be on the more top-end plans, but these are still fairly affordable options. The Optus SIM-only deals are reasonably priced and you can get some pretty big data inclusions. It’s definitely worth checking out what offers Optus is currently running for students to see if you can grab a cheaper plan or some great extras. As students know, it’s always best to shop around to find the best deals. While the big three telcos often have the most enticing deals for the majority of users (thanks to extras like data-free entertainment streaming), it can still pay to go with a smaller provider. One thing to remember is that most of these telcos only offer SIM-only plans: so if you’re after a new phone, you’ll most likely need to look at the big three telcos unless you buy your phone outright. Companies such as Exetel, Moose Mobile, TeleChoice and Southern Phone all offer competitive phone plans, with periodical data bonuses and other discounts from time to time. You might also find some of these telcos offer both month-to-month and contract versions of plans. Often if you’re willing to stick to a contract —whether it’s 12 or 24 months— you could get extra data or a cheaper monthly rate, so it’s worth considering whether you’re happy to be locked in or not. While these smaller telcos generally don’t offer student-only discounts, the competitive pricing is enough of a draw if you’re looking to save money. Below is a range of postpaid phone plans from some smaller telcos, at a range of different price points. This table includes links to our referral partners. For those who like to avoid bill shock, a prepaid phone plan could be the right option for you. You’ll find that prepaid plans don’t tend to vary much from postpaid options — you can still get good call, SMS and mobile data inclusions, but quite often for a lower monthly fee. Some prepaid providers even include generous international call inclusions, along with some entertainment extras. If you’ve already got a phone you’re happy with, switching to a prepaid deal could save some money. 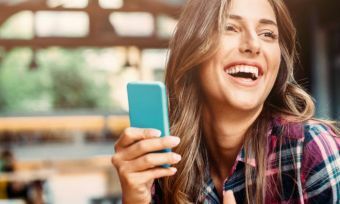 While prepaid isn’t as popular as it once was, the smaller telcos that do focus on prepaid plans — such as Boost Mobile, OVO Mobile and Catch Connect — manage to squeeze some good value in. Boost Mobile, for example, includes unlimited international calls to select countries on all plans (plus data-free streaming of Apple Music), while OVO includes data-free streaming of a range of sports and radio stations. Whatever value you’re after, you might find the right deal for you if you’re looking at prepaid plans. The below table includes links to products from our referral partners. Are student phone deals good value? Realistically, determining if a phone plan is good value depends on your situation. How you use your phone is the biggest factor when it comes to which provider and plan will suit you, so it’s still best to shop around and compare. If you’re looking for student-specific deals, Vodafone does put the most effort into a range of student-only offers, however you might struggle to find the student deals on the Telstra and Optus websites, but once you do find them, you could grab yourself a good deal. For students who are penny-pinching and looking for a cheaper phone plan, staying on top of the latest deals can save you money in the long run. It’s also worth considering a plan from a telco that provides data-free streaming and other perks, if this is something you know you’ll use a lot of. Overall, it’s a good time to be a student on the hunt for a phone deal – there are so many providers out there with attractive offers, all you have to do is shop around. What are the best phone plan deals? How do I port my mobile number?